Whether it’s a weekend or a short stay, two days may not seem enough to enjoy the wonders of the Sorrento Peninsula and the Amalfi Coast, but following this itinerary planned in every detail you can still visit some of the most fascinating sites. The first day we will discover the blue island of Capri with a specialised tour with an exceptional guide. Once back, we will enjoy the breathtaking view from the Villa Comunale and then a stop in Sorrento old Town to savour the best gelato. Before dinner an aperitif on the most famous terrace of Sorrento and then dinner in a historic restaurant. The second day of our itinerary in Sorrento, we will visit the Amalfi Coast and touring Positano, Praiano, Amalfi and Ravello. Back in Sorrento, after a quick break at your accommodation, take a stroll on Corso Italia, an aperitif on a terrace with a stunning view of the Bay. Finally, we will then head towards one of the most characteristic villages of Sorrento, the seaside village of Marina Grande, where we will have dinner near the sea. Yes, for the two-day itinerary the alarm clock is expected to be quite early. In fact, to be able to see the best that the Sorrento Peninsula offers in two days, you have to lift your head off the pillow and enjoy this fantastic area from the early hours of the morning. The appointment therefore with an icon of our culture, a cup of espresso coffee. 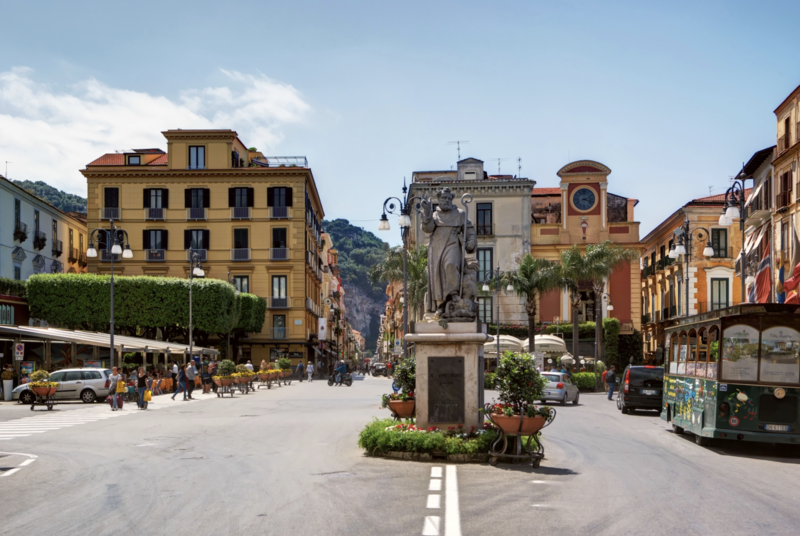 Piazza Tasso is the heartbeat of Sorrento, the square is bordered by restaurants and cafès where people relax with a coffee and watch the hustle and bustle of Sorrento. In Piazza Tasso there are five cafès, so it can be hard to choose. In the morning, I order and drink coffee (my favorite coffee style is espresso ristretto, (with a small amount of sugar) standing at the Fauno Bar, one of the most popular cafes in Sorrento, which also offers a wide selection of cornetti (croissants), sweet pastries and cakes, it serves an excellent Neapolitan coffee, tasty and creamy. After feeding the body and nourishing the soul, the day can start. From Piazza Tasso, we are in the centre of Sorrento and we are heading towards the harbour of Marina Piccola. Every day thousands of visitors visit Capri from Sorrento by shared or private tours. Especially during Summer, if you don’t book in advance you can find yourself joining a low quality boat tour with no experienced skippers. In Sorrento, dozens of companies offer daily tours to Capri and after years of testing, experience and listening to hundreds of reviews from visitors who joined and shared their experiences, I strongly recommend two reliable skippers who ensure unforgettable days. The tour, shared with a maximum of ten people, is organized on boats equipped with bathroom, shower, kitchen, sundeck which ensures comfort on board. In my opinion, in addition to being the best tour to visit Capri in one day, it allows you to experience an exclusive day at a reasonable price, without the crowds of large boats because the limited number of people, and above all you can relax avoiding queues at the boardings . In addition, drinks are included all day as well as a sandwich for lunch and if there is an event to celebrate (and trust me, Italians always find a reason to celebrate) the skipper will open a fresh cold bottle of prosecco. If you are a group of about 8-12 people I strongly suggest you organize yourself in advance by booking the whole boat just for you, so you can save money and customise your tour. If you are a group of about 8-12 people I strongly suggest you organize yourself in advance by booking the whole boat just for you, so you can save money and customize your tour. Departure to Capri – Sailing along the Sorrento Coast will take approximately 60 minutes, along the way you will admire, the ancient fishing village of “Marina Grande”, the ruins of a Roman Villa near “Bagni della Regina Giovanna” with its natural pool and the ruins of the Roman Villa. The natural waterfall that flows from the rock, and other interesting attractions along the coast. The skipper will give you all the necessary information to discover the White Grotto, the Natural Arch, Villa Malaparte and the Faraglioni rocks. The icons of Capri will welcome you from Punta Tragara. Marina Piccola, the most exclusive bay of Capri, is a postcard perfect with a feeling of magic with amazing yachts, luxurious villas, five stars hotels and seaside restaurants. Here, the skipper will moor the boat and you can enjoy a tasty caprese sandwich, included in the price, in one of the bathing establishments. Then there will be a couple of stops for swimming, snorkeling, a relaxing break with snacks and drinks offered on board, and a chance to visit the island of Capri for about three hours. Returning back, we will keep circumnavigating on the other side of the island, and you can admire the Green Grotto, the Lighthouse of Punta Carena and the famous Blue Grotto. The return will be a pleasant dance on the waters of the Gulf of Sorrento, sipping a glass of prosecco and admiring one of the most beautiful landscapes in the world. From the Port of Sorrento, sunbathed with salty air, we head along the road to reach the lift that will take us up to Villa Comunale. You can’t miss a visit to Villa Comunale, with its gardens and the marvellous terrace overlooking the Gulf of ​​Sorrento, where it is hard to find the words to describe the amazing view of the Gulf of Naples and his majesty the Vesuvius. Then, immediately outside the gardens, a quick visit to the Church of San Francesco and its Cloister, a silent oasis in the heart of the city, it is one of the oldest and most visited monuments in Sorrento for its romantic and zen atmosphere. Today it hosts numerous concerts of classical music, cultural events and celebrations of civil marriages. Leave behind you the stunning views of the Villa Comunale and turn right walking on via Padre Reginaldo Giuliani, one of the entrances in the old town of Sorrento. The old Town is mostly pedestrianised and it still preserves some medieval buildings, Antichi Palazzi with facades typical of the 13th century, original decorations and ancient churches. The main streets are lined with lemon products and leather shops. About 2 minutes by foot we are going to cross via dell’Accamedia and just in front of us, another great sight to capture, the Bell Tower with the majolica clock as background of Sedil Dominova. All framed by the fascinating buildings of ‘Nineteenth century that stand on the side of the road. After this long walk you can not miss a delicious ice cream. Conveniently, the best gelato in Sorrento is only 30 seconds walk from the Sedile Dominova. Raki offers authentic and organic gelato, with selected high quality ingredients. Owners say, their ultimate ambition is getting visitors to fall in love with their gelato. Trust me, I am in love and in my opinion, Raki ice-cream is by far, one of the best in Italy. So stop here for and grab one of their hand-made cones, load it up with several scoops (vanilla, ginger and walnut are my favorite) and enjoy! Once back at the starting point Piazza Tasso, you can now return home or to your room, depending on where you are staying and after some well deserved rest, get ready for the first night out. It has been a long day and a few hours rest is well deserved, after taking a quick shower which helps you refresh, with a smile on your face while looking at the photos taken during the day. We cannot miss the best part, after this time get ready to enjoy a special evening. Vittoria Terrace, Grand Hotel Excelsior Vittoria. Located in the most exclusive hotel in Sorrento, it is indeed the most famous terrace on the Sorrento Peninsula. It is open to the public, and is an exclusive spot where you can enjoy a fabulous evening, either sipping on a glass of wine or enjoying an Aperol Spritz with a magnificent view of the Gulf of Naples, this Terrace is priceless and breathtaking. The Grand Hotel Excelsior Vittoria, is located in Piazza Tasso, it is award-winning luxury and it is really worth taking an unforgettable moment for you and your partner in a special location. In the heart of Sorrento Old Town , L’Antica Trattoria is one of the most delicious restaurants of our peninsula and is certainly among those we recommend to live an original experience. Savouring the flavours and recipes of the Sorrentina gastronomic culture. Excellent for the quality of the products, for the location and type of food served, it is value for money. A perfect mix of traditional recipes and innovation, the Chef continually amazes with his dishes made from ingredients from our territory. You will also find fantastic and friendly staff. The guided tour of the Amalfi Coast is one of the most fascinating experiences to live in Campania region. Every day, thousands of visitors leave from Sorrento to visit Positano, Amalfi and Ravello and if you leave it until last minute, you may not find available seats or tours. In Sorrento, there are dozens of companies that offer shared or private tours on the Amalfi Coast. I recommend a private tour if you are a group of four people or more to have flexibility. After many years of experience and hundreds of reviews, there are two professional and reliable English speaker drivers we recommend to ensure an unforgettable day. The tour of the Amalfi Coast, shared with a limited number of people, is organized with minivans equipped with bathroom, air conditioning which ensures comfort on board. But again, if you are more than four people, you should organise a private tour with one of the specialised drivers and rent the whole car or minivan. The private tour, in addition to being the best to visit the Amalfi Coast allows you to experience an exclusive day at a reasonable price, with qualified drivers who know every corner of our land. You can customise your trip and above all you will experience an authentic tour without the crowds on big buses and relaxing in comfort of air conditioned vehicles. The first cliffside on the Amalfi Coast is Positano, one of the most beautiful villages in Italy. This picturesque, romantic town is perched on the hillside with pastel- colored houses nestled above the water, lemon groves and amazing villas that offer great views of the stunning coastline. Here you can stroll through the narrow streets with craft shops selling the famous Positano fashion linen dresses, walk along the Spiaggia Grande and take some memorable pictures . If you have some time left, visit the church of Santa Maria Assunta. Next stop Amalfi, passing through the charming villages of Praiano ( a serene fishing town where you will find authentic culture, relaxing spots and natural beauty). Furore and Conca dei Marini in Amalfi, are graceful towns with great traditions, artistic monuments and beautiful landscapes. You can visit Piazza del Duomo, clustered with elegant shops and cafes (Pasticceria Andrea Pansa is a must), it is considered the heart of the village where the dramatic cathedral of Sant’Andrea is set. The Duomo of Sant’Andrea is a truly beautiful structure and it is also the towns most important sight. It is worth visiting the Museo della Carta (Paper Museum) to see how paper products are made by hand. High up in the mountains is the last stop Ravello, a romantic village perched on the mountains of Amalfi, where you can admire the most spectacular views of the coast. During your free time, we suggest you to walk between Piazza Vescovado and its alleys, or visit the splendid Villa Rufolo, a 13th century villa with the famous gardens overlooking the sea. Once back in Sorrento, you can stop for a drink in Tasso Square or you can return home or to your room, depending on where you are staying to rest and take a shower. Here we are at the end, or almost, of my two days itinerary to visit Sorrento. I said almost, because there are still a few hours left and after some well deserved rest, the best is yet to come. Located on the top floor of the luxurious Hotel la Favorita, this amazing rooftop has got a fabulous atmosphere. You will be in front of one of the most beautiful views in the world. At non-prohibitive prices, in an informal setting but decorated in every detail, you can sip tasty cocktails and have a bite to eat choosing from the interesting Mediterranean seafood menu. After enjoying a spritz on the Terrace Bellavista, immediately after the panoramic Piazza Vittoria, there is the Hotel Syrene, awarded with the worlds sexiest bedroom in 2015. Next to the Hotel Syrene, there is an old path taking you down along the Coast, between Villas and panoramic spots, at the end, turn right and go down the steps, go through the 2500 year old Greek Gate and the marina greets you in all of its beauty. Considered by many the favourite place in Sorrento, Marina Grande is definetely worth a visit. The colourful and picturesque fishing village on the edge of the Bay, it is a great place to have a drink on the side of the dock and grab something to eat. You can find a lot of local trattorias with good meals at reasonable prices and waterfront restaurants with a buzzing atmosphere. During the summer, and especially on weekends, evenings are very busy for dinner. I do recommend to have lunch at Trattoria da Emilia, one of the most historic authentic restaurants owned by a local family from the Marina.